A woman who thought there should be more, Fox River Home Care is a locally owned and operated home health care company who loves what they do. It is a lifestyle, not a career for the owner, Julie Minikowski. With over 30 years of experience in care giving, she thought there should be more to the job than working for a corporation or franchised company that was more worried about the bottom line and not the client. Our goal is to create a honest and caring environment while treating your home as if it were our own. We care for local clients with local caregivers and can be contacted at any time of the day for your convenience. 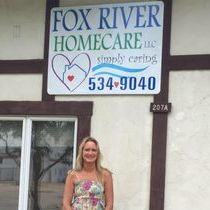 Fox River Home Care provides compassionate, loving and professional services to our local community.